Bouncy, bouncy, bouncy... Gotta love that fan service. It's killer. "This must be an ordeal that was fated for me. It's my destiny. Yes, this is the hardship destined for such a cute little girl. Oh god, I just called myself a cute little girl." Poor Nanako... you must have it so hard. Sold by her family to pay off mounting financial debt, Nanako must take on whatever the good doctor throws at her, whether it be cooking meals, cleaning up messes, or being a nurse assistant. He's also making her endure a harsh body training program for some reason... All she knows is if she refuses... she will have her breasts removed, be cut open at the navel, and be given the ultimate lobotomy. But besides that, everything is fine, right? Wrong. Something smells not quite right with the place Nanako works, Ogami General Hospital. Maybe it's the eccentric doctors she has to deal with. Maybe it's the fact that the hospital is on a U.S. Military base. Or maybe it's the simple fact that Nanako is just a complete blunderhead. At any rate, something REALLY fishy is going on between the Pentagon and the Vatican, and when a bizarre creature known as "GREEN" is transported to the hospital, it's up to Dr. Kyoji Ogami to conduct an alien autopsy. But, when Nanako returns from her training -- all hell breaks loose. Somebody needs to put a bell on this girl. She seems to always be getting into some type of trouble. The opening credit sequence for each episode is unique, highlighting certain points in the story and characters. The ending credits remain the same throughout, featuring scenes showing Nanako training and working out before going into a super-deformed CG-sequence depicting chibi versions of Nanako and Dr. Kyoji along with the Venus 2000 robot. The song which accompanies the ending credits is a catchy and fun tune entitled "Nanako no Sentaku," sung by Nanako's Japanese voice actress, Maria Yamamoto. A nice touch for the release is that the original Japanese credits were kept intact and a separate English version on a black background appears after the original credits. However, a subtitle translation of the theme song does not appear. The one thing that makes the series shine, besides Nanako's 'bouncy' nature, is the excellent voice acting for Nanako Shichigusa. Maria Yamamoto and her English counterpart, Mariah Martin, both bring something unique to the role. Maria's acting gives a playful portrayal of Nanako while Mariah's stresses the cute and innocent nature of Nanako. And Nicholas Jakes' portrayal of the English version of Dr. Kyoji Ogami adds a lot of chemistry to the wacky situations. The DVD sports a series of letterbox aspect (16:9 screen ratio) menus featuring various shots of Nanako, complete with background music. DVD extras include Japanese TV spots for all 6 of the Nanako Kaitai Shinsyo OVA releases, 25 character design sketches, and the hilarious Animetronic spoof called Nanakotronic, featuring various fan service scenes set to a bizarre beat complete with cheesy sound effects. Plus, there is a free plastic Nanako character mini-standee that is included. 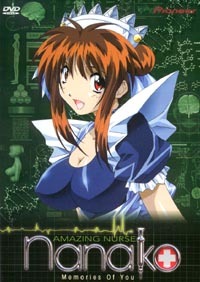 If a conspiracy-laden comedy with tons of fan service would be just the cure for you, then give Amazing Nurse Nanako a try... Doctor's orders.